Photo by Danielle Barbour Warwick residents gather at the Elks Lodge in Greenwood Lake to launch three new Community2gether projects. Photo provided by Geoffrey Howard. Kayakers working in the Wawayanda Creek to clear debris. To find out more or get involved in the project, visit the Wawayonders Facebook page. Planning is underway for the Three Lakes Festival in Warwick next summer. Events - from flotillas, canoe races to fishing contests and educational programs will be held at Glenmere Lake, Wickham Lake and Greenwood Lake, all designed to promote a greater sense of community within all of the Town of Warwick. Photo by Jonathan Talbot. Pictured left to right: Vision Co-chair Geoff Howard, Vision Co-chair Roger Moss,Warwick Town Supervisor Michael Sweeton, Village of Warwick Mayor Michael Newhard, Greenwood Lake Mayor Jesse Dwyer, Florida Mayor Daniel Harter Jr., Vision Co-chair Tony Trimarco, and Vision Consultant Gianni Longo. Community 2000 to deliver 'TOGETHER: Building Tomorrow Today' planning document to town and village officials. 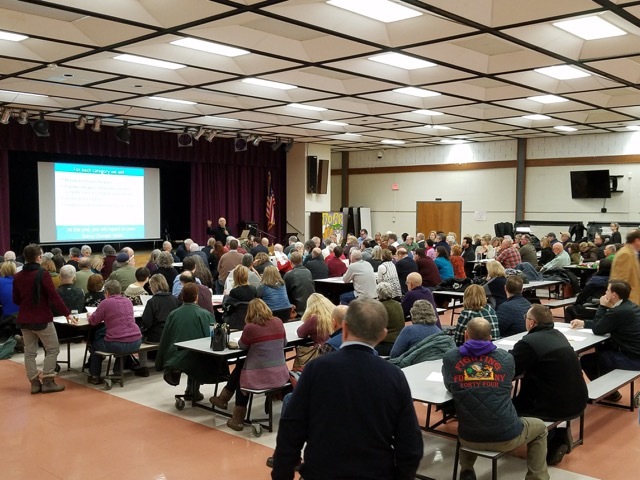 On Monday, Dec 11th, more than 150 Warwick residents attended the much-anticipated Community Voices meeting at the Warwick Middle School. The crowd represented a true cross-section of the larger community — the Villages and Hamlets, farmers, artists, merchants, musicians, commuters and local government officials — all were there and actively participating. That meeting was one of the key events in the Community Visioning project that has been going on since late summer. Those who came were asked to do two things: first, to vote, using hi-tech electronic keypads, on which goals they felt were most important to the entire community; and second to suggest possible “game-changing ideas” for Warwick. While the complete results of the voting and the idea-generating won’t be known officially for a few weeks, positive ideas have already emerged about things such as improved zoning for balanced growth, better pedestrian access and safety, bike lanes, infrastructure improvements, and much more. One of the strongest outcomes of the meeting was the sense that if the entire Town were to grow in the best way, it would take a balance of government action and increased civic engagement, with residents in all communities working together. Fortunately, that hoped-for civic engagement was fully evident at the meeting. As the meeting drew to a close, fully 90% of those in attendance said they were willing to get involved in helping the Vision process move forward and 86 people signed individual pledge cards detailing how they were willing to help. Once Community 2000 and the Visioning Steering Committee have reviewed and organized the data by category, action teams will be formed — some governmental, some community-based, some mixed — to determine how best to make these ideas become reality. Part of the audience that turned out for the Community Voices meeting on Dec. 11. This is an open call to all Warwickians: wouldn’t you like to have some say about what will and won’t happen here in the next 20 years? You can! Warwick — the entire Town and the 3 Villages — is in the middle of a Visioning project called Community2gether. Visioning involves a community coming together and deciding what they do and don’t want to see in their community. Those four words, “coming together and deciding,” will be the focus of the Town-wide Community Voices meeting on Monday, December 11 from 7 - 9 pm at the Warwick Middle School cafeteria. If you’re concerned about how Warwick can grow and prosper without losing the special qualities that make the Town, the Villages, the hamlets special … come to this meeting. If you would like to see young people and seniors be able to afford to live here … come to this meeting. If you have ideas for the kinds of businesses you would like to see — or not see — in our community … come to this meeting. If you like your community just the way it is … come to this meeting. If you see some things that you know could be done better … come to this meeting. If you think it’s a bad idea to sit back and just accept what happens … come to this meeting. It’s time to “come together and decide” on December 11. Mark your calendars! Published in The Warwick Advertiser, October 3, 2017. Community 2000, Warwick’s community development non-profit, along with Town Supervisor Michael Sweeton, Mayors Jesse Dwyer, Greenwood Lake, Michael Newhard, Warwick, and Jim Pawliczek, Florida will host a potluck picnic party to kick off the 2017 Community Visioning survey. The family-friendly event, is to be held on Sunday, September 10 from 3-6 PM at Warwick Town Park on Union Corners Rd. Children of all ages are welcome. The name of the Community Visioning project is “TOGETHER: Building Tomorrow Today.” The process invites everyone who lives or works anywhere in the Warwick Valley to think about how they would like to see their community develop over the next 20 years. The public is encouraged to share their ideas by completing a survey that will be posted on the TOGETHER website - www.community2gether.org – starting the following day. The survey will ask questions about the quality of life throughout the Warwick Valley. It will take only 7 or 8 minutes to complete and will be totally anonymous. Community 2000 is hoping for at least 1,000 completed surveys before the end of September. Survey results will be posted on the TOGETHER website. Public meetings will be scheduled in November to review survey results, suggest additions, and prioritize preliminary community goals to serve as the foundation of the TOGETHER vision. “It’s up to YOU, the public, to imagine what the Warwick Valley has the potential to achieve. It will be as bold as your imagination! Learn more when you join us for the kick-off potluck picnic party,” adds Community 2000 President Roger Moss. Community 2000 is a 501(c)(3) organization. Your donations are gratefully accepted.